Why advertise your business with a vehicle graphic or sign? As a business owner, you appreciate the importance of effective advertising. Radio ads may not be heard by the customers you’re trying to reach and can be expensive. No one reads the newspaper anymore. And internet advertising can be an uphill battle trying to get found on Google. However, with people driving so many miles these days, perhaps no other form of advertising is as most effective. Your company’s car or truck can stand out and make a memorable impression; leading to community awareness of your services. Well, think about the number of cars that pass you (or you pass) every day you go to the market, pick up kids from school, or are just stuck in traffic. That’s how many opportunities someone who drives a vehicle with their business information on it gets everyday to sell their services. And when you consider that you actually have a life and can’t spend every minute on your business, what if you could advertise it 24 hours a day, 7 days a week without even trying? Now you’re beginning to see the wisdom in using your vehicle as a mobile billboard! Now, before you go and grab a marker to write your contact information on your car’s windows, calm down. You have to realize that it isn’t just the fact that the information is ON the vehicle that will get you into the minds of potential customers. It’s HOW it’s done that matters. For example, I don’t know how many times I’ve driven off the freeway and seen a sign claiming to teach me how to make my income increase by ten’s of thousands of dollars that was written by hand with a marker on a piece of cardboard! Really? I doubt it. But why? Because of the sign! Well-designed vehicle graphics can really get you noticed and give people a way to know you are available to help. AND make them WANT to call you. Vehicle graphics can be placed on virtually any part of a car. They can be made of very durable materials that are rated to last years. And rather than just using simple, cut out vinyl letters, you can have full-color, photo quality graphics that ‘pop’ and get noticed. 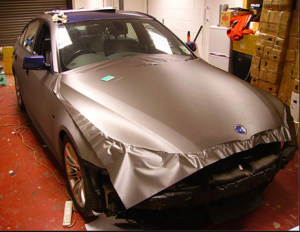 In addition, when you consider how much it can cost to paint a work vehicle to look presentable, why not take the money and give it a full wrap for relatively the same price or cheaper; especially if the body is relatively straight? Trying to advertise in the newspaper can cost you thousands of dollars over a period of a few years. Advertising on the radio can cost a chunk too. But if you drive a vehicle (which who doesn’t these days), then you can get great exposure for your business and advertise everywhere you go more effectively; all for a price that’s competitive with other forms of advertising. When trying to come up with a design for your car or truck that will work in real life, vinyl car wrap Denver specialists can make things easier. We can help make the design in your imagination a reality. We’ll work with the wrap installation company to format the design in a way that you can use. Then we’ll give you a copy to keep and use as you see fit! We can also set you up with a professional installation technician who can have you rolling around town in no time! How do vehicle wraps & signs work? Basically, vinyl car wrap Denver specialists can take high quality graphics, vibrant colors, and stunning designs and use them to ‘frame’ your vehicle; making it stand out in the community. We don’t use cheap, single-color vinyl cut outs! These designs are made to be ‘printed’ on durable, thick coatings which can be sealed to last for years! We’ll work with you to accomplish your goals. Vehicles can be covered in full or partial wraps. Or we can even design smaller signage to fit over windows, hoods, sides, or trunk lids.